The congregations are listed alphabetically by place, with the name of the church preceding the town, city, or village. An asterisk (*) indicates a change in status since the last report. Church websites are independently managed and maintained. For questions or comments on those websites, please contact the church directly. For clergy looking to apply for open positions under the “Receiving Names” categories, please respond to this questionnaire and contact: The Reverend Canon Brian Jemmott at bjemmott@dioceseofnj.org or at (609) 394-5281 ext. 21. Congregations wishing to request a background check of a candidate should use this form. Please contact Canon Jemmott with questions about the below listings or for assistance. To check open positions across the Episcopal Church log onto the OTM Database or visit their website. The Reverend Kristen Foley called as a three-quarter time Priest-in-Charge, effective January 27, 2019. The Reverend Zachary Mark Smith called as Priest-in-Charge, effective May 29, 2019. The Reverend Alan Leonard called as Rector, effective February 2, 2019. The Reverend Jennifer Ovenstone Smith called as Rector, effective March 25, 2019. The Reverend Michael J. Way called as Priest-in-Charge, effective April 1, 2019. The Reverend Douglas C. Halvorsen called as Priest-in-Charge, effective February 1, 2019. The Reverend Ophelia Laughlin called as Priest-in-Charge, effective February 1, 2019. The Reverend Jeffery Roy called as Priest-in-Charge, effective January 1, 2019. The Reverend Carol Pepe, Deacon, called as Deacon Administrator, effective February 25, 2019. 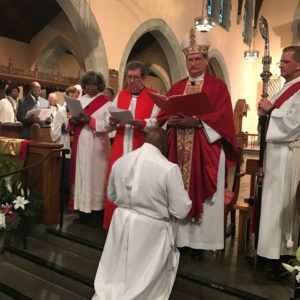 The Reverend Canon Richard C. Wrede called as Priest-in-Charge, effective August 1, 2019. Discernment Committee reviewing candidate materials. Seeking a Rector. Online materials posted March 12 – application deadline April 15, 2019. Seeking a half-time Priest-in-Charge. Online materials posted November 28 – application deadline: Until position is filled. Seeking a half-time Priest-in-Charge. Discernment reopened. Online materials reposted January 9 – application deadline April 30, 2019. Seeking a Full time Priest-in-Charge. Online tools posted April 5. Deadline, May 6. Seeking a Full-time Interim Priest. Application deadline, May 5, 2019. Town Hall held on September 26. Discernment Committee formed. Orientation of Vestry and Discernment Committee completed on March 10. Congregational Conversation conducted March 31. Will be seeking a Priest-in-Charge. Town Hall meeting scheduled conducted on March 17. Readiness Assessment conducted April 12. Church affiliation in process. Orientation of Vestries to be scheduled. Orientation of Discernment Committee and Vestries conducted March 31. Congregational Workshops to be scheduled. Congregations using supply clergy. Affiliation in process. Orientation of Discernment Committee and Vestries, conducted on March 14. Congregational Workshop conducted on April 7. Beginning work on online tools for posting. Congregation using supply clergy. Discernment Committee formed. Congregational Workshop conducted on March 31. Readiness assessment, Discernment Committee orientation, and Congregational Conversation conducted. Online materials in development. Will be seeking a half-time Priest-in-Charge. Discernment Committee formed. Orientation of Vestry and Discernment Committee held. Town Hall held on September 12 and Congregational Conversation to be scheduled. Town Hall held on July 15. Discernment Committee formed. Orientations held. Congregational Conversation held on November 4. Materials for posting being developed. Congregation using supply clergy. Wardens and Vestry in consultation with Bishop’s office. Wardens and Vestry in consultation with Bishop’s office. Effective January 21, 2018, Merger of Church of the Atonement, Laurel Springs and St. John’s in the Wilderness, Gibbsboro.